Two organisations can be seen as contesting the political landscape of early twentieth century Queensland. The Australian Workers Union (AWU) was established out of a number of different groups after the failure of the supposedly ‘General Strike’ of 1912. Rigid and hierarchical, the AWU recruited largely in the rural and non-industrialised areas of Queensland’s interior, becoming the state’s largest workers’ organisation. Playing a decidedly conservative political role, the Union championed White Australia and the language of class conciliation. The Communist Party of Australia was formed by a small group of far left activists from a variety of different backgrounds and geographical locations in October of 1920. Coming in the heady wake of the Bolshevik revolution in Russia, this cosmopolitan organisation, comprised almost entirely of urbanites and industrial workers, sought to provide a militant alternative to the mainstream Labor movement in line with the dictates of the Moscow-based Third International. 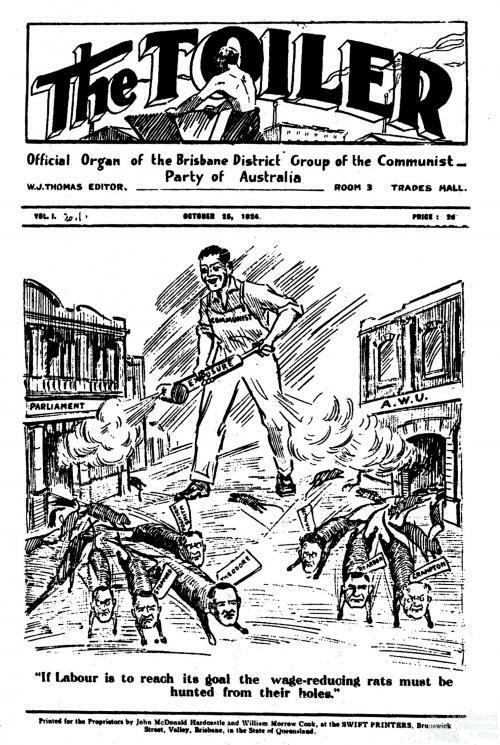 The above cartoon, appearing in the first issue of the CP’s Brisbane paper The Toiler in 1924, depicts a resolute communist worker exterminating the ‘rats’ of the mainstream labour movement with the power of ‘exposure’. As well as illustrates the level of animosity which existed, made official by October 1923’s imposition of an ‘anti-communist pledge’ to Labor Party membership, this cartoon also reveals the strongly masculinist overtones of communist literature from the time.